In June 1915, Ray Morrison became SMU's football, baseball, basketball, and track coach, in addition to being to a math instructor. The football team began as a member of the Texas Intercollegiate Athletic Association, playing at Armstrong Field. 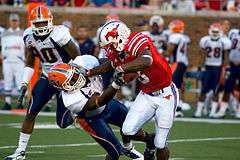 The first game played by SMU's football team was a 13-2 victory over Hendrix College. After winning two games in a span of two seasons, Morrison left SMU for Fort Oglethorpe upon the United States’ entry into World War I. During this time, the football team was known as "the Parsons", due to the large number of theology students on the team. On October 17, 1917, the name "Mustangs" was selected as the school's mascot. For the 1917 season, Morrison would be replaced by J. Burton Rix, who would lead the Mustangs to a 3-2-3 record in their final season in the TIAA. The 1918 season would be the first of many seasons for the SMU Mustangs as a member of the Southwest Conference, joining Baylor University, Rice University, the University of Texas, Texas A&M University, the University of Arkansas, and Oklahoma A&M University. The Mustangs’ first season in the conference ended with a 4-2 record. J. Burton Rix would continue to coach the team until the 1921 season, in which he was replaced by W.A. Cunningham and Victor Kelly, his co-coaches that season, as the team went on to lose six games. Ray Morrison would return to SMU in 1922, co-coaching the team with former Vanderbilt teammate Ewing Y. Freeland. For the 1922 and 1923 seasons, Morrison would focus on the backfield and ends, while Freeland focused on the linemen. The team became known as the "Aerial Circus" by sportswriters because of Morrison's passing offense. Morrison would become known as "the father of the forward pass", due to the team's use of passing on first and second downs, instead of as a play of last resort. At the time, most teams utilized the forward pass five to six times in one game, while SMU would do so between 30 and 40 times. In the 1922 season, the Mustangs would compile a 6-3-1 record. Furthermore, end Gene Bedford and back Logan Stollenwerck were named first-team All-Southwest Conference, becoming the first SMU football players to receive that honor. Bedford would go on to be the first player to play in the National Football League for the Rochester Jeffersons. In the 1923 season, the SMU Mustangs would go on to compile a perfect 9-0 record, winning their first conference football title in school history. After this season, Freeland would leave the SMU football team, later becoming head coach for the Texas Tech University football team, leaving Morrison as the sole head coach for SMU. SMU would go on to play in their first bowl game in 1924, playing in the Dixie Classic against West Virginia Wesleyan College, though would end up losing that game 7-9. By 1926, the team began playing their home games at Ownby Stadium. In their first game at Ownby Stadium, the Mustangs defeated North Texas State Teachers College 42-0, led by quarterback Gerald Mann. The first Homecoming game would also be played in 1926, resulting in a 14-13 victory over Texas Christian University. The team would continue to have winning seasons until the 1932 season. The Mustangs would win their second conference title in 1926, compiling an 8-0-1 record, and a third conference title in 1931, compiling a 9-0-1 record. In 1928, guard Choc Sanders would become SMU's first All-American, as well the first All-American from the Southwest Conference. In 1929, tackle Marion Hammon would become SMU's second All-American. After a winning 1934 season, Morrison left SMU to take over the Vanderbilt Commodores football team after the retirement of Dan McGugin. Morrison would be replaced by Matty Bell in 1935. Known as a player's coach, Bell brought discipline to his team, and he spent time listening and talking to his players. In his first season, Bell would lead the Mustangs to 12-1 record. During this season, the Mustangs were ranked number one in the nation. In order to play in the Rose Bowl against the Stanford Indians football team for the unofficial national championship, SMU faced off against the TCU Horned Frogs, who featured star quarterback Sammy Baugh. The 1935 SMU-TCU football game is generally considered the greatest game in SMU history, as Bobby Wilson scored two touchdowns to give SMU a 14–0 lead before Baugh rallied the Horned Frogs to a 14–14 tie. Early in the fourth quarter, Bob Finley connected on a long pass to Wilson after the Mustangs faced a fourth down at the TCU 39. Wilson caught the ball at the five and rolled into the endzone as the Mustangs held on to win, 20–14, and earned a trip to the Rose Bowl. Winning their fourth conference title, the Mustangs would go on to lose the Rose Bowl to Stanford 0-7. Despite this, the 1935 SMU Mustangs were selected by the Dickinson System as national champions, their first football national championship in school history. The Mustangs had three more winning seasons from 1936 to 1939. SMU would come up short of winning the Southwest Conference title in 1940, despite having the same conference record as the Texas A&M Aggies. After a 5-5 season in 1941, Bell would leave SMU to serve in the United States Navy during World War II. With Bell in the Navy, Jimmy Stewart took his place as head coach. In his three seasons as head coach, Stewart compiled an overall record of 10–18–2. Bell would return as head coach for the 1945 season. Upon Bell's return as SMU's head coach, the team also gained the talent of halfback and placekicker Doak Walker. Walker would win All-Southwest Conference honors his freshman year in 1945 and play in the East–West Shrine Game in San Francisco. Walker would not play for the 1946 season due to serving in the United States Army, yet re-enrolled at SMU and rejoined the football team for the 1947 season. The Mustangs would post a 9-0-2 record in 1947, winning their sixth Southwest Conference title. In the same season, the team would play against the Penn State Nittany Lions in the Cotton Bowl Classic, resulting in a 13-13 tie. Walker threw a 53-yard touchdown pass and scored on two-yard run in this game. Walker would also earn the Maxwell Award during this season. During the 1948 season, the Mustangs would win their seventh conference title, posting a 9-1-1 record. The team would go on to play in the Cotton Bowl Classic once more, defeating the Oregon Webfoots, who were led by quarterback Norm Van Brocklin, 21-13, making it their first victory in a bowl game in school history. Doak Walker, winning All-American honors, would also win the Heisman Trophy, the first Mustang to do so in school history. Additionally, the Mustangs would permanently move to the Cotton Bowl for their home games this season, after playing only certain games in that stadium in years past. In their final game at Ownby Stadium, the Mustangs would defeat Texas Tech 41-6. Due to Doak Walker's popularity, the Cotton Bowl became known as "The House that Doak Built". The 1949 season would be both Doak Walker and coach Matty Bell's last as part of SMU's football team. The team would post a 5-4-1 record. Walker would win All-American honors a third time, the most for any football player in SMU's history. Bell would continue to serve SMU as the athletic director, while Walker would go on to play in the NFL for the Detroit Lions. Over the course of his career at SMU, Walker rushed for 1,954 yards, passed for 1,638 yards, scored 288 points, punted for a 39.4 average and kicked field goals and extra points. He is also the Mustangs' all-time leader in punt return yards with 750. Bell would leave the head coaching position at SMU with a 79-40-8 record, including three Southwest Conference titles, a bowl game victory, and a national championship. Bell would be replaced by Rusty Russell in 1950. Russell previously served as quarterbacks and running backs coach from 1945 to 1949, and is attributed to luring Doak Walker away from the University of Texas. In three seasons as head coach, Russell would compile a 13-15-2 record. After a strong first season, in which the Mustangs were ranked number one in the nation, the team would suffer two losing seasons. Becoming increasingly under fire, Russell resigned as head coach after the 1952 season. However, it did not stop SMU players from achieving certain honors throughout Russell's time as head coach; Kyle Rote, who filled Doak Walker's place on the team, led the Southwest Conference with 777 yards rushing in 1949, and was named an All-American following the 1950 season. Quarterback Fred Benners led the Mustangs to perhaps their greatest win of the decade when he completed 22 of 42 passes for 336 yards to beat Notre Dame, 27–20, in Notre Dame, Indiana on October 13, 1951. Benners connected on TD passes of 57, 37, 31 and four yards to four different receivers as the Mustangs beat the Fighting Irish in what was one of the highlights in a 3–6–1 season. Furthermore, Forrest Gregg would become part of the team in 1952, and became a two-time All-Southwest Conference player by 1955, later moving on to the NFL. Moreover, David Powell would become SMU's first Academic All-American winner in the 1952 season. Woody Woodard took Russell's place as head coach in 1953. Woodard would compile a 19-20-1 record in his four seasons as head coach for SMU, resigning after two consecutive losing seasons. During the 1954 season, wide receiver Raymond Berry was elected as a co-captain, despite only catching 11 passes for 144 yards, winning All-Southwest Conference and Academic All-American honors, and would later play in the NFL for the Baltimore Colts. Woodard was replaced by Bill Meek in 1957, who was coming off of a Missouri Valley Conference title-winning season with the Houston Cougars football team. In five seasons with SMU, Meek compiled a 17-29-4 record. During Meek's time as head coach, quarterback Don Meredith would earn All-American honors in 1958 and 1959, with his .610 career completion percentage being the best of any passer in SMU history, with a tremendous running ability increasing pressure on opposing defenses. The 1960 season, though, proved particularly bad for the Mustangs, as they went 0-9-1, with the only game decided by less than 10 points being a 0–0 tie with Texas A&M. After the 1961 season, Meek would leave SMU, replaced by Hayden Fry. Hayden Fry became the eighth head coach in SMU's history in 1962. The 1963 season provided the SMU football program with one of its most memorable games when the Mustangs hosted fourth-ranked the Navy Midshipmen and its quarterback, Roger Staubach, on October 11, 1963, at the Cotton Bowl. On its way to a 4–7 season, SMU was given little chance to beat the Midshipmen. Little-known sophomore John Roderick rushed for 146 yards on 11 carries and scored on touchdown runs of 45 and two yards for the Mustangs. The SMU defense, led by Bob Oyler, Martin Cude, Bill Harlan, Harold Magers and Doug January, sent Staubach to the bench twice with a dislocated left shoulder. Trailing 28–26 with 2:52 remaining in the game, SMU had one last chance to pull off the upset. Quarterback Danny Thomas threw to Billy Gannon, who ran to the Navy 46. On the next play, Roderick took a pitchout 23 yards to the 23. After a pass interference penalty against Navy put the ball on the one-yard line, Gannon plowed over the right tackle for the winning touchdown with 2:05 left. The SMU defense held off Staubach's effort to rally his team for one last score, as the Mustangs pulled off the 32–28 upset. Despite a losing record in 1963, the Mustangs played in the Sun Bowl, their first since the 1948 season, against the Oregon Webfoots, losing 14-21. During the 1966 season, Hayden Fry lifted SMU back to national prominence, when SMU was ranked ninth in the nation and won its first conference championship in 18 years, their seventh overall. Fry would also win Conference Coach of the Year. SMU would go on to lose the Cotton Bowl Classic to the Georgia Bulldogs 9-24. John LaGrone, who earned conference honors from 1964–66, was the first Mustang player to be selected as both an All-American and Academic All-American when he was honored following the 1966 season. After Fry's departure, Dave Smith, a former assistant coach under Fry, took his place as head coach. Coming off of a 7-4 season with Oklahoma State, Smith would have two consecutive 6-4-1 seasons with SMU, with his final season resulting in a 4-7 record. In three seasons with SMU, Smith compiled a 16-15-2 record. Smith would be replaced by Ron Meyer in 1976. In 1987, SMU football became the first, and currently only, football program in collegiate athletic history to receive the "death penalty" for repeat violation of NCAA rules, that is, having a sports program fully terminated for a determined amount of time. SMU's football program was terminated for the 1987 season because the University was making approximately $61,000 in booster payments from 1985 to 1986. It later emerged that a slush fund had been used to pay players as early as the mid-1970s, and athletic officials had known about it as early as 1981. SMU was eligible for the "death penalty" because it had been placed on probation in 1985 for recruiting violations. Since many potential student-athletes were poor, boosters would induce them to sign with SMU by offering them payments and expense coverage. Several key boosters and administration officials determined that it would not only be unethical to cut off those payments, but also potentially problematic as some boosters were contractually obligated to pay the athletes for the duration of their time at SMU. There was also the real potential of disgruntled football players "blowing the whistle" on SMU should the payments not continue. When the sanctions were handed down, SMU had three players – all seniors about to graduate – receiving payments. Not long afterward, SMU announced that its football team would stay shuttered for the 1988 season as well after school officials received indications that they wouldn't have enough experienced players to field a viable team as most of the team left the university and transferred to other institutions. Forrest Gregg, an SMU alum who was the head coach of the Green Bay Packers, was hired in 1988 to help rebuild the team. The decimation of the program meant that Gregg was left with an undersized and underweight lineup. The Mustangs had 3 more head coaches and only one winning season through the completion of the 2007 season. 2008–2014: "There and Back Again"
In 2008 SMU hired Steve Orsini away from the University of Central Florida (UCF) to be the SMU Athletic Director. Orsini then hired June Jones from the University of Hawai'i to be the team's new head coach at SMU and the 5th coach in the post death penalty time since 1989. In Jones' first season at SMU the team had a 1-11 record. In 2009, Coach Jones' second season at SMU, the Mustangs had a turnaround season, compiling an improved regular season record of 7-5. Although finishing unranked in the 2009 NCAA Division I FBS football rankings, SMU was invited to its first bowl game in 25 years, defeating the unranked Nevada Wolf Pack with a final score 45-10 in the 2009 Hawai'i Bowl, the team's first bowl win since 1984. In 2010, the Mustangs again compiled a regular season record of 7-5, with a 6-2 in-conference record to earn their first chance at winning a conference title in 26 years, securing a berth in the Conference USA Championship game. SMU lost the conference title game, 17-7, against UCF. Once again unranked in the 2010 NCAA Division I FBS football rankings, SMU was invited to its second consecutive bowl game, the 2010 Armed Forces Bowl, where it lost against the unranked Army Black Knights. Following Texas A&M's move to the SEC in August and September 2011, SMU have made it known that they would like to replace them in the Big 12. On September 3, 2011, Athletic Director Steve Orsini stated: "We want stability in the regional conference that meets our objective", Orsini said, "and that right now would be defined as the Big 12." "Regionalism is a sign of strength, and we feel expansion, especially in the latest trends, is a sign of strength", Orsini said. "And we feel we can help an AQ conference in both of those areas." Orsini made it clear that SMU isn't solely interested in the Big 12, but in finding an AQ home. Should the Mustangs' current league, Conference USA, achieve AQ status someday, that would work just fine. Maybe the Mountain West earns an AQ distinction and decides to dip back into the Metroplex again. "When we were affiliated with those schools in this region [Baylor, Texas and Texas Tech], we were competing very successfully", Orsini reminded. "We have a lot of conference championships in the Southwest Conference to show for it." "We're ready. It took us a long time to rebound from the historic low that hit here, but that was 25 years ago. There are no signs of that anymore." SMU's interest in the Big 12 was never reciprocated, and the Big 12 instead added TCU and West Virginia University. SMU went on to win back-to-back bowl games in the 2012 BBVA Compass Bowl (for the 2011 season) and 2012 Hawaii Bowl. SMU ended the Jones Era in 2014 the way it began: with a 1-11 season. The Mustangs won the last game of the season against the University of Connecticut on December 6, 2014. SMU hired Chad Morris as head coach and announced his placement on December 1, 2014. His first season resulted in a 2-10 record, a slight improvement from the 2014 season. The NCAA's website states that "the NCAA does not conduct a national championship in Division I-A football and is not involved in the selection process." It goes on to say that "a number of polling organizations provide a final ranking of Division I-A football teams at the end of each season." SMU officially claims three national championships (1935, 1981 & 1982). (The NCAA officially changed the "I-A" designation to the Division I Football Bowl Subdivision (FBS) in 2006.) Nonetheless, neither the 1981 nor 1982 claim is recognized by most observers, as the AP and Coaches poll winners are widely regarded as the national champion in college football circles. SMU's claims in 1981 and 1982 are based on poll championships awarded by lesser known and/or obscure polling/ranking systems. The SMU-Rice rivalry is a secondary one for both SMU (after TCU) and Rice (after Houston). However, it is a storied one based on the fact that SMU is located inside the city of Dallas and Rice is located in Houston, the anchors of Texas' two largest metropolitan areas. Notably, SMU and Rice are two of the smaller universities in NCAA Division I FBS. Adding fuel to the fire is the fact that Rice and SMU are consistently ranked the best two private universities in Texas. In 1998 a traveling trophy, the "Mayor's Cup", was introduced to the series, and has been awarded to the winner each year. The Rice Owls currently hold the trophy after the 2012 game and lead the trophy series 9-6. However, the future of the trophy is unclear, as SMU left Conference USA for The American for the 2013 season, and no future games are scheduled. SMU and Navy have played each other 18 times with Navy leading the series 11-7. In 2009, the athletic departments of the United States Naval Academy and Southern Methodist University created the Gansz Trophy in honor of Frank Gansz who played linebacker at the Naval Academy from 1957 through 1959 and eventually the coaching staff at SMU. Although SMU and North Texas share the Dallas–Fort Worth metroplex as their home, this is seldom a rivalry. SMU leads the all-time series 30-5-1. The two teams have played 36 times dating back to 1922. The most recent meetings between the two teams occurred in 2015, with the Mustangs beating North Texas 31-13. After SMU moved to The American, North Texas was invited to Conference USA. The game is often referred to as the Safeway Bowl which derives its name from a challenge from then North Texas head coach Matt Simon issued in 1994 after a two-year break in the series, stating "I'd like to play because I think we could beat them, and my players feel the same way. If they'd like to play on a Safeway parking lot ... just give us a date and time." SMU and North Texas will play each other every year from 2014 to 2025 for a scheduled twelve-game series. ↑ "SMU Licensing". Retrieved 2016-08-20. ↑ Frank, Peter (1987-04-11). "'88 football season canceled by SMU". New York Times. ↑ "SMU Mustangs future schedules". fbschedules.com. Retrieved 2014-08-02.